We’re excited to announce a new eLearning program that allows organizations of all sizes to easily onboard and train people on Tableau. We have designed over 20 hours of engaging content, starting with our most popular courses, Desktop I: Fundamentals and Desktop II: Intermediate. It provides your organization an easy and efficient way to learn Tableau, and realize the full potential of the platform. Employees can now learn Tableau at their own pace when their schedules allow. A flexible learning experience allows them to go through a guided curriculum or choose lessons on an as-needed basis. The lessons are designed to increase topic retention and keep learners engaged and motivated. "Tableau eLearning explains the concept, breaks it down into understandable chunks, and then provides a hands-on activity,” said one eLearning user. “It is now my preferred way to learn Tableau." Tableau eLearning helps organizations ensure a consistent and complete onboarding and education experience at scale. Learners can validate their understanding of core concepts with built-in skill assessments and hands-on activities. And administrators can see detailed usage reports to monitor progress and help drive completion of core curriculum, ensuring all of their users have the same foundational knowledge of Tableau. 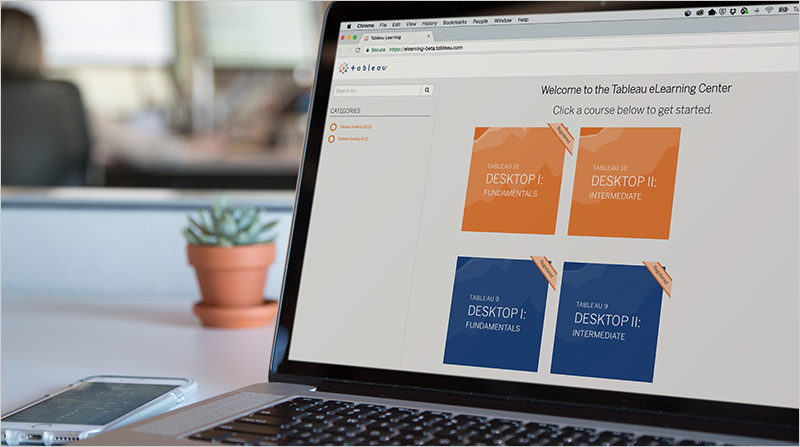 Tableau’s eLearning program has already inspired hundreds of people to dig deeper into their data and work more independently with Tableau Desktop. During the initial beta program, 78% of customers said they use Tableau more after having used Tableau eLearning. So how much does it cost? eLearning is the most economical way for your organization to educate a large number of people. At $400 per user, each learner has access to Desktop I: Fundamentals and Desktop II: Intermediate courses, enabling companies to affordably onboard users faster than ever before. And if you still want to meet with us face-to-face, our in-person classes, along with our incredible Tableau Conference, are available for in-depth learning. Ready to give it try? Start now!